With 31 titles from 17 publishers in the Youth Division and 38 titles from 21 publishers in the Adult Division, there were so many incredible books which made the selection of a winner difficult. We wish we could recognize every entry if it were at all possible. Soviet Daughter: A Graphic Revolution by Julia Alekseyeva, illustrated by Julia Alekseyeva. Microcosm Publishing. In Soviet Daughter, author and illustrator Julia Alekseyeva retells the life story of her great-grandmother Lola, a Ukrainian Jew and witness to the Bolshevik revolution, Stalin’s reign, and the Holocaust. A strong willed and remarkable character, Lola survives these hardships of war, fear, and poverty with fierce independence and wit. Through interludes between historical chapters, the author explores her loving relationship with her great-grandmother and draws comparisons between the challenges faced by her ancestors and those of the present day. A stunning work of oral history and an artistic triumph worthy of being shelved next to such graphic memoirs as Maus, Fun Home, and Persepolis, Soviet Daughter will introduce readers to a pair of truly iconoclastic Jewish women. 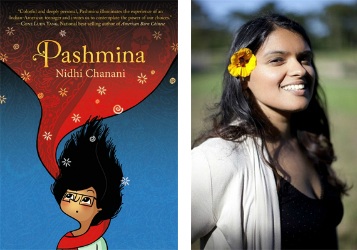 Pashmina by Nidhi Chanani, illustrated by Nidhi Chanani. First Second, Imprint of Macmillan Children's Publishing Group. Our young protagonist, Priyanka, finds herself trapped between two worlds: that of the America she lives in and that of the India her mother left behind. Pri is bursting with questions about everything from her father, to her heritage, to her mother’s past; however, her mother refuses to speak about these topics and more. As Pri struggles with her mother’s silence and her own acrimony, she discovers a pashmina that, when worn, allows Pri to travel to the India she has always dreamed of knowing. Simple cartoon-style illustrations in black-and-white fill the book, but when Pri dons her pashmina the pages become filled with bright colors, differentiating the new setting in which the shawl enables her to step from drab, colorless reality. This book strikes the perfect balance between being fun and entertaining while also being culturally meaningful. This is a must-have for any juvenile graphic novel collection. Alters, Volume 1: The Story of Chalice by Paul Jenkins, illustrated by Leila Leiz. Aftershock Comics. Superheroes and the LGBTQ community collide to tell an amazingly diverse and attention-grabbing story. Alters Volume 1: The Story of Chalice has an enticing plot that perfectly portrays the main character's many dichotomies, including her connection to the LGBTQ community. The character's feelings, struggles, reservations, and triumphs are depicted accurately and honestly. The traditional comic book style artwork is absolutely beautiful with vibrant and colorful illustrations. All features unite to create a graphic novel you will not want to put down and have you clamoring for more volumes. Ladycastle by Delilah S. Dawson, illustrated by Becca Farrow and Ashley A. Woods. BOOM! Studios. Ladycastle brings modern feminism to a medieval time, making for a clever and rousing graphic novel. It is funny and stimulating, breaking away from traditional strategies of war and politics. The dialogue between the characters is witty and thought-provoking, while the narrative provides comical relief with pop culture references. Artwork is crisp and clean. All aspects combine to create a splendid and entertaining read. Lissa: A Story about Medical Promise, Friendship, and Revolution by Sherine Hamdy and Coleman Nye, illustrated by Sarula Bao and Caroline Brewer. University of Toronto Press. 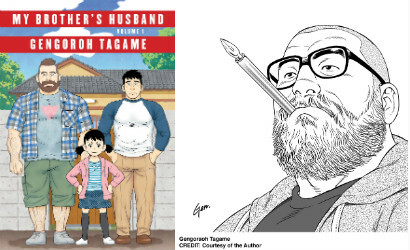 My Brother’s Husband, Volume 1 by Gengoroh Tagame, translated from the Japanese by Anne Ishii, illustrated by Gengoroh Tagame. Pantheons. My Brother’s Husband is wonderfully original and sends a truly diverse message of understanding, acceptance, and everything else in between. It is a truthful depiction of one’s thought process when dealing with diverse situations, including cultural biases and others’ influence on your own thoughts and behavior. The manga style artwork is amazing, depicting different genders, ages, and nationalities accurately and strikingly. The plot is engaging and tackles the topic from a variety of viewpoints. This novel can be used as a tool to initiate an open and honest conversation between parent and child regarding the LGBTQ community. My Lesbian Experience with Lonelinessby Nagata Kabi, illustrated by Nagata Kabi. Seven Seas Entertainment. You could be fooled by the subtle pink shades into thinking Kabi Nagata’s My Lesbian Experience with Loneliness is a “girly,” confessional type of true life manga. Instead, she draws you in with a realistic, in-depth portrayal of her struggles with anxiety and depression. Follow her personal and heartfelt journey from wounded, isolated child to suffering, but healing, adult. You will empathize with her attempts to cope through her powerfully honest words and her engaging, emotive artwork. Afar by Leila Del Duca, illustrated by Kit Seaton. Image Comics. The world depicted in Afar showcases the duality of science-fiction fantasy at its best: it is familiar and unfamiliar, ancient and futuristic, earthly and supernatural. The main characters, siblings Boetema and Inotu, are also multifaceted. Having been left alone for several months by their parents, the teens end up on the run from a cyborg bodyguard. They flee their home and encounter danger and adventure on their journey across a vast desert. Boetema and Inotu are strong and emotional characters, and they must learn to depend on themselves and on each other. Meanwhile, Boetema struggles with a new-found ability to astral project into other universes, leading to encounters with bizarre creatures in her dreams. The human cast of Afar is made up entirely of people of color, and the work visually incorporates elements of African, Middle Eastern, and Asian histories and cultures. Graphic novel collections are in need of more diverse fantasy entries, and Afar is an excellent choice and addition. It's relatable, enjoyable, magical, strange, and sure to intrigue teen readers from all backgrounds. 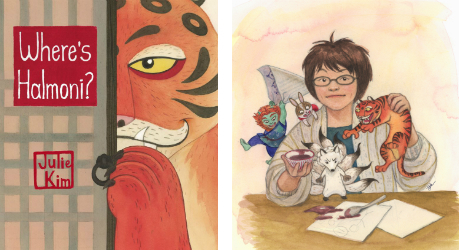 Finding Molly: An Adventure in Catsitting by Justine Prado, illustrated by Jenn St-Onge. Emet Comics. Finding Molly: An Adventure in Catsitting is a fun take on the life of a biracial young woman in her early 20s. Molly, the daughter of immigrants, draws upon her cultural heritage and love of Frida Kahlo to inspire her art. After finishing art school, she finds herself adrift in life with no direction. She’s stuck in her parents' home in the suburbs, butting heads as they talk about the “old country,” and how she should get married and give them grandchildren. In a desperate attempt to find herself, Molly starts a webcomic about her adventures as a freelance catsitter. As Molly’s art gains traction, she is able to move closer to her friends in Los Angeles, where she discovers how complicated being an adult can be. Finding Molly highlights cultural diversity, and the divide that can come between the children of immigrants and their parents. The art of Finding Molly is cartoony and full of bold lines, vibrant colors, and cute cats. This title is recommended for teens who are in the process of finding their own inspiration to create. Where’s Halmoni? by Julie Kim, illustrated by Julie Kim. Little Bigfoot, imprint of Sasquatch Books. Two young siblings search for their halmoni (grandmother in Korean) in Where’s Halmoni?, an adorable story influenced by traditional Korean folktales. A seamless merging of two cultures, Korean-American Noona and Joon encounter classic Korean characters on their magical journey navigating a beautifully depicted countryside. Working together, and with the help of Joon’s unending supply of snacks, the two outwit the rabbit, the goblins, the tiger, and the wily fox on their way to find Halmoni. Noona and Joon speak English, but the dialogue of the animals and goblins is shown in Korean, (translations are provided in the back), allowing for an immersive bilingual experience for readers. There are some titles that deserve to be recognized so the committee has selected 5 titles for the overfloweth list. These books deserve to find readers and this is our way to get the word out. Beirut won’t Cry by Mazen Kerbaj, illustrated by Mazen Kerbaj. Fantagraphics Books. Mazen Kerbaj’s Beirut Won’t Cry grabs you with its chaotic, atmospheric art immediately, reflecting a traumatic time of uncertainty (the 2006 Lebanon War). Kerbaj’s powerful words and drawings speak for the living and the dead, so that both are never silenced. The kinetic, dark tones of the artwork ebb and flow with the emotions experienced by Kerbaj, ranging from bleak despair and anger to the promise of a hopeful future and an ultimately satisfying resolution. Generation Zero, Volume 1: We Are the Future by Fred Van Lente, illustrated by Francis Portela, Derek Charm, Diego Bernard. Valiant Entertainment. Generation Zero was taken from their families and trained to become an experimental strike force. After escaping their handlers, this team of super-powered youth now seek the justice they never received by helping others. The title opens on Keisha, a normal high school student who seeks the help of Generation Zero because she believes something is very wrong in her hometown following the mysterious death of her boyfriend. With art and a palette that situates this debut series firmly in the superhero genre, Generation Zero, Volume 1: We are the Future balances an action-packed storyline with diverse characters that can appeal to a wide variety of readers. Unique among traditional superhero graphic novels is a realistic and honest depiction of an autistic character. Generations by Flavia Biondi, illustrated by Flavia Biondi. Lion Forge. 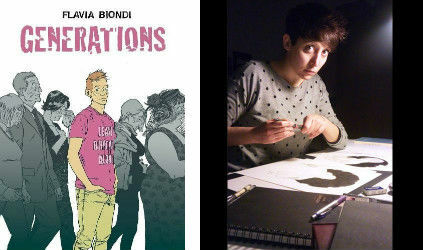 In Generations, author Flavia Biondi uses straightforward and relatable illustrations to tackle the story of inter-generational relationships and changing social norms. Mateo, gay and facing the failure of his relationship, returns home for the first time in three years. In an effort to avoid seeing his conservative father, he moves in with his grandmother and aunts who have their own ideas about how he should live his life. Generations is a realistic and touching story that gives the reader an opportunity to peer into the heart of a post coming-of-age world that extends past a person and a moment and into the lives of everyone in the family. (H)afrocentric, Volumes 1-4 by Juliana “Jewels” Smith, illustrated by Ronald Nelson. PM Press. Part magical realism, part polemic, (H)afrocentric introduces us to a multi-racial crew of college students as they fight gentrification in Oakland, California, with block parties and cultural references. Funny and hip, (H)afrocentric features an irreverent and gutsy heroine the next generation of activists will love to root for. Motor Crush, Volume 1 by Brenden Fletcher, Cameron Stewart, Babs Tarr, illustrated by Cameron Stewart, Babs Tarr. Image Comics. In Motor Crush, we meet Domino Swift, a strong, independent black woman who is one of the top motorcycle racers on the circuit. Caught between her competition in the legitimate World Grand Prix and her fight to win deadly street races for the payoff of a stimulant named Crush, Domino must go faster than ever before to keep her loved ones safe. Motor Crush is all about the high-octane action, but diverse characters add depth without being singled out as unusual. The vibrant colors and art style perfectly captures the frenetic pace and youthful energy of this title. A unique addition is the creative use of “pop-up” panels to reveal a futuristic world where technology is ever-present and invasive, which is not too far removed from our present reality. Run For it: Stories of Slaves Who Fought For Their Freedom by Marcelo D’Salete, illustrated by Marcelo D’Salete. Fantagraphics Books. 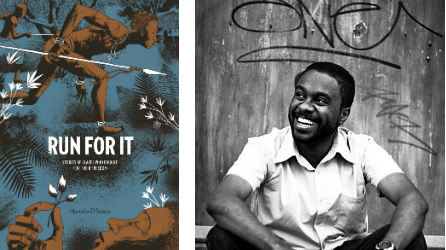 In Run for It, author Marcelo D’Salete skillfully weaves four individual stories of Brazilian slaves into a single title about the fight for freedom. Each story is unique and unexpected, but in each the author doesn't shy away from the truth of a slave’s existence. D’Salete’s smudgy, expressive brushwork combined with a simple black and white palette allow for a surprising complexity and a haunting atmosphere. The touches of magical realism and inclusion of Bantu and African symbology layers the spiritual beliefs of the African slaves over their very real experiences in colonial-era Brazil. The honest depiction of what these individuals went through and the decisions they had to make will bring a broader understanding of the horrors of slavery to all readers. Speed Demonz Night by Gabe Lamberty, illustrated by Gabe Lamberty & Jacinto Moyano Guererro. Angry Viking Press. With a diverse cast of gangsters and anti-heroes, Speed Demonz Night is a revenge story chock full of gun fights, car chases, and explosions. Readers will be kept guessing as to which character dies next, as few of these villains will make it to the finish line of this deadly race. The Backstagers, Volume 1: Rebels Without Applause by James Tynion IV, illustrated by Rian Sygh. Boom! Studios. The Backstagers, Vol. 1 begins with teen protagonist Jory hiding anxiously in the bushes at his new all-boys private high school. Despite his trepidation, Jory attempts to join the Drama Club but instead finds himself amidst the stage crew: a group of diverse guys who navigate the secret world behind the curtains - when they aren't building sets and rigging lights, that is. This work is a magical mashup of high school realism and zany action-adventure, and the characters deal with everything from social anxieties and first crushes to shifting labyrinths and creepy creatures. GFFs: Ghost Friends Forever by Monica Gallagher, illustrated by Kata Kane. CharmZ Books, imprint of Papercutz. Sophia Greene-Campos’ life seems to be spinning out of control. A girl of mixed heritage living with her father, she longs to be part of the old family business in paranormal services, but that went with her mother and brother in the divorce. To make matters worse, her ex-boyfriend is her brother’s best friend and now she has stumbled on a lonely girl ghost haunting a picturesque covered bridge. As the story unfolds, Sophia finds herself drawn to the lonely spirit and develops romantic feelings for her. Because she is young and relatively inexperienced, she will need the help of Felix and former boyfriend Jake to unravel Whitney’s reason for haunting the bridge. Full color artwork and engaging story are bound to attract younger readers of both genders. M.F.K. by Nilah Magruder, illustrated by Nilah Magruder. Insight Comics. M.F.K. opens on a sandstorm falling upon the village of Little Marigold. Jaime and his grandfather are out in the storm to setup the Sand collector when they spot a figure struggling through the storm. Jaime rescues Abby who has to put down her dying Moa. Under the care of Jaime’s Aunt Nifrain, the doctor, Abby begins to heal. As she learns more about Jaime and the town, Parasai, superhuman individuals, arrive demanding tributes from the poor desert folks, and cause destruction when they don’t get what they want. Abby has a secret that may just save the town from destruction. The artwork glows with vibrant colors, drawing the reader into each panel as the story progresses. Rich tones depicting the desert landscape and active battle scenes that leap from the pages make M. F. K. a treat to experience. But don’t ask what M.F.K. stands for; the author will reveal that in her own time. 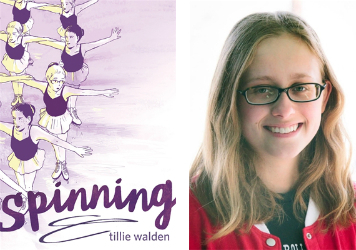 Spinning by Tillie Walden, illustrated by Tillie Walden. First Second, Imprint of Macmillan Children's Publishing Group. Spinning is an autobiographical account of what it’s like to grow up gay as a figure skater in Texas. This heart-wrenching story begins when Tillie’s family moves to Texas, forcing her to leave her friends, school, and skate rink. The new rink is unfamiliar--filled with strangers, a new coach, and a different scoring system than Tillie is used to. Every morning for Tillie is the same—wake up before the sun, grab her skates, and get to the rink to practice before school. Every weekend is spent in glitter and tights, hair pulled back into tight bun, and a forced smile as she performs. Tillie was good at what she did, and she hated it. The world of skating—so closed minded, so prim and proper—didn’t fit Tillie. The story follows Tillie as she wrestles with the truth about herself: she’s gay, life is hard, and she does not want to skate anymore. The art is somber, filled with cool colors and thin lines. A purple hue fills the pages, a depressing shadow representing Tillie's state of mind as she goes through the motions each day. This title is recommended for teens who, when life is hard, could use a dose of cathartic realism and inspiration. Star Scouts by Mike Lawrence, illustrated by Mike Lawrence. First Second, Imprint of Macmillan Children's Publishing Group. 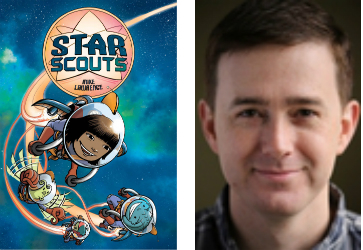 Star Scouts is a fun take on the traditional scout camp story. Bull-riding, country-music fan Avani doesn’t think she has anything in common with her boy-crazy, pop-music-loving fellow Flower Scouts. When she’s accidentally abducted by a friendly alien named Mabel, Junior Star Scout Third Class, Avani finds the acceptance she’s been craving. Avani returns home with a new open-minded attitude, thanks to the lessons she learned with the Star Scouts. Brilliant illustrations cleverly depict the impressive diversity of aliens and contributes to the overall theme of tolerance and acceptance. Filled with humor geared toward elementary readers, Star Scouts is an engaging and entertaining read.